I fish stillwaters more often these days. I relish my yearly opportunity to fish the great trout lakes of the interior region of British Columbia. While many of my traditional stream patterns that come from my overstocked fly boxes work in the stillwater environs, there had been one food source that routinely confounded me – the Callibaetis mayfly hatch. Oh I had some patterns that would catch some fish – the Adams and Thorax Callibaetis on top, and a GRHE sub-surface – but I hadn’t been able to catch fish as consistently during these major hatches as I thought I should. I set out to create a fly that would help swing the odds in my favor. I wanted to create a series of emerger patterns that float correctly on the water. Suspending tantalizingly in the surface film during this vulnerable stage, trout find them an easy meal. If the fly begins to sink, it should do so at a very slow rate, allowing the angler to fish the first few inches of the water column where actively feeding fish concentrate. I knew what I wanted the fly to behave, but now I needed to incorporate a trigger into the pattern to make it effective. Prowling through a craft store one evening, I came across some small plastic pearlescent beads. Light reflected off of them beautifully, and I was immediately intrigued with the possibilities of working this into my emerger fly design. I hurried home to my tying bench. Borrowing from Gary LaFontaine’s idea that an aura is created by a nymph as it breaks through its wingcase to unfold its wings (Gary used packing foam to simulate this). I used the pearlescent bead to mimic this event. Additionally, it would aid in floating the fly and positioning it to hang correctly in the surface film. The shuck material will be awash in the water, the deer hair imitates the emerging wings of the insect, and the grizzly hackle will imitate a fluttering, struggling movement. The hackle also helps hold the fly on the surface. The emerger is both in and out of the surface. My intention was for the Bubble Boy to be a style of fly, rather than a specific recipe. While I use PMD and BWO versions frequently, the size of the bead precludes its use on sizes much smaller than a #14 hook. A size #10 or #12 scud hook seems the ideal choice for a well proportioned fly. The short shank and wide gap allow for the use of the bead without stretching the bounds of reality in terms of overall length of the fly. As it happens, this size range most effectively matches predominate Callibaetis hatches throughout the Northwest season. I’ll leave the other options to your adaptation. I vividly recall the day when the Bubble Boy earned a permanent place in my lake fly box. Simply because I thought my new pattern made sense didn’t prove a thing until the fish accepted or rejected my premises. My Dad and I were fishing a small lake near Merritt, B.C. in early June a few years ago. The weather had been a mix of showers, wind, with a few sun breaks here and there. Leeches, damselfly nymphs, and chironomids had brought fish to hand, but we hadn’t seen anything more than abbreviations of the renowned Callibaetis hatches this region offers. One afternoon I found a little cove sheltered from the constant wind. The showers had abated, the sun had warmed the cool morning air, and I found myself looking over the first decent hatch of the trip. I watched fish working the shoreline and methodically taking the little speckled “sailboats” from the surface. I tied on a Bubble Boy, targeted one particularly large fish, and timed my cast to meet the next feeding location on its path. Bingo! It all came together as he arrived right on schedule, sipped my fly, and turned downward. I set the hook and quietly boated a sleek 20″ rainbow. My heart was racing! I proceeded to follow the same tactics for the next hour – timing my cast to intercept a cruising fish – and enjoyed some incredible surface action. I landed a dozen or more quality Kamloops rainbows on that inaugural Bubble Boy. When the hatch had quieted, I continued picking up the occasional fish that presumably took it as a cripple. Whatever the reason, the Bubble Boy provided the best fishing of the trip. The most exciting thing to me is that when I’ve been in the midst of Callibaetis hatches when there were literally hundreds of insects on the water, the Bubble Boy routinely gets selected. There must be something, indeed, that triggers a response in the trout. I no longer feel ill-equipped to fish a good Callibaetis hatch. You need not either. Hook: Daiichi 1130 or similar lightweight scud hook, #12 -14. Hackle: Grizzly, undersized, wrapped 2-3 times between the butts and the wing and once in between the wing and the bead. Note: The hackle can be clipped to a “V” on bottom. 3. Select a small amount of natural deer hair (don’t overload it) and tie it in with the tips extending forward over the bead and eye of the hook. As a general guide, length of the wing is about equal to that of the body. This represents the emerging wing, so it’s not necessary to have it perfectly stacked and neat, though it certainly can be. 7. Grasp the waste ends of the deer hair used for the wing and carefully clip them, leaving an 1/8″ or so right on top of the shank. 8. 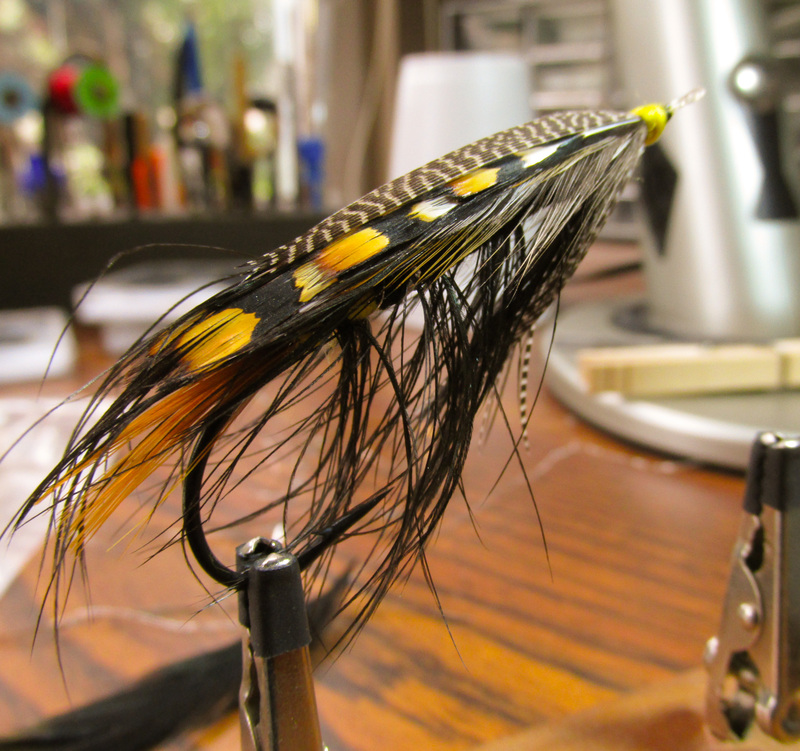 Clip the hackle into a “V” on the bottom if desired for better balance in floatation. Check your email. Thanks for your interest. Hi Monte: You are probably fishing. Could you send me your address so I can send you a check for 12 “Bubble Boy” flies? I first saw your Bubble boy on Hans site and it gave me the idea of cutting off the packing foam legs off from GLF’s “Air Head; your pattern would be far more durable. I need to add a hackle collar and then they should be set to go.